This promotional pocket knife comes with six different tools that are sure to come in handy and leave a positive impression. This stainless steel knife features a knife, a nail file, scissors, tweezers, toothpick, and a split keyring. 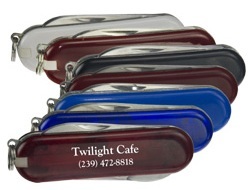 Have your company name or logo screen-imprinted on these versatile personalized pocket knives and theyl make a long lasting and positive promotional item. In addition we also offer many other promotional tools.